There is no question that the recovery from the global recession triggered by the 2008 financial crisis has been unusually lengthy and anemic. Some still expect an upswing in growth. 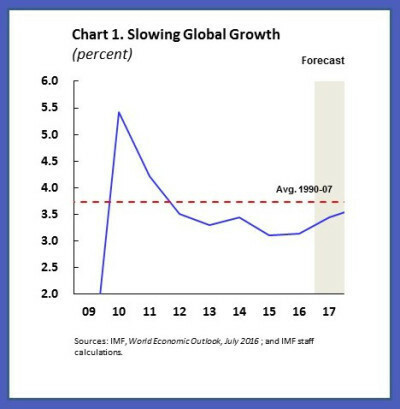 But, eight years after the crisis erupted, what the global economy is experiencing is starting to look less like a slow recovery than like a new low-growth equilibrium. Why is this happening, and is there anything we can do about it? One potential explanation for this “new normal” that has gotten a lot of attention is declining productivity growth. But, despite considerable data and analysis, productivity’s role in the current malaise has been difficult to pin down – and, in fact, seems not to be as pivotal as many think. Of course, slowing productivity growth is not good for longer-term economic performance, and it may be among the forces holding back the United States as it approaches “full” employment. But, in much of the rest of the world, other factors – namely, inadequate aggregate demand and significant output gaps, rooted in excess capacity and underused assets (including people) – seem more important. In the eurozone, for example, aggregate demand in many member countries has been constrained by, among other things, Germany’s large current-account surplus, which amounted to 8.5% of GDP in 2015. With higher aggregate demand and more efficient use of existing human capital and other resources, economies could achieve a significant boost in medium-term growth, even without productivity gains. None of this is to say that we should ignore the productivity challenge. But the truth is that productivity is not the principal economic problem right now. Tackling the most urgent problems confronting the world economy will require action by multiple actors – not just central banks. Yet, thus far, monetary authorities have shouldered much of the burden of the crisis response. First, they intervened to prevent the financial system’s collapse, and, later, to stop a sovereign-debt and banking crisis in Europe. Then they continued to suppress interest rates and the yield curve, elevating asset prices, which boosted demand via wealth effects. But this approach, despite doing some good, has run its course. Ultra-low – even negative – interest rates have failed to restore aggregate demand or stimulate investment. And the exchange-rate transmission channel won’t do much good, because it does not augment aggregate demand; it just shifts demand around among countries’ tradable sectors. Inflation would help, but even the most expansionary monetary measures have been struggling to raise inflation to targets, Japan being a case in point. One reason for this is inadequate aggregate demand. Monetary policy should never have been expected to shift economies to a sustainably higher growth trajectory by itself. And, in fact, it wasn’t: monetary policy was explicitly intended to buy time for households, the financial sector, and sovereigns to repair their balance sheets and for growth-enhancing policies to kick in. Unfortunately, governments did not go nearly far enough in pursuing complementary fiscal and structural responses. One reason is that fiscal authorities in many countries – in particular, in Japan and parts of Europe – have been constrained by high sovereign-debt levels. Furthermore, in a low interest-rate environment, they can live with debt overhangs. For highly indebted governments, low interest rates are critical to keep debt levels sustainable and ease pressure to restructure debt and recapitalize banks. The shift to a high sovereign-debt-yield equilibrium would make it impossible to achieve fiscal balance. In the eurozone, the European Central Bank’s commitment, announced in 2012, to prevent debt levels from becoming unsustainable is politically conditional on fiscal restraint. There are also political motivations at play. Politicians simply prefer to keep the burden on monetary policy and avoid pursuing difficult or unpopular policies – including structural reforms, debt restructuring, and the recapitalization of banks – aimed at boosting market access and flexibility, even if it means undermining medium-term growth. The result is that economies are stuck in a so-called Nash equilibrium, in which no participant can gain through unilateral action. If central banks attempt to exit their aggressively accommodative policies without complementary actions to restructure debt or restore demand, growth, and investment, growth will suffer – as will central banks’ credibility, or even their independence. But exit they must, because expansionary monetary policies have reached the point at which they may be doing more harm than good. By suppressing returns to savers and holders of assets for a protracted period, low interest rates have spurred a frantic search for yield. This takes two forms. One is rising leverage, which has increased globally by about $70 trillion since 2008, largely (though not entirely) in China. The other is capital-flow volatility, which has driven policymakers in some countries to pursue their own monetary easing or to impose capital controls, in order to prevent damage to growth in the tradable sector. It is past time for political leaders to show more courage in implementing structural and social-security reforms that may impede growth for a time, but will stabilize their countries’ fiscal position. More generally, fiscal authorities need to do a much better job of cooperating with their monetary counterparts, domestically and internationally. Such action will probably have to wait until the political consequences of low growth, high inequality, mistrust of international trade and investment, and the loss of central-bank independence become too great to bear. That probably won’t happen right away; but, given the rise of populist leaders seizing on these adverse trends to win support, it may not be too far off. In this sense, populism can be a beneficial force, as it challenges a problematic status quo. But the risk remains that, if populist leaders do secure power, they will pursue policies that lead to even worse results.